Not only that… but the threat (as they become more prone to slamming doors) of losing the solid door is much more real if there is already a screen. Teens can’t disappear into their caves or close you out as much with a screen door. When we were house hunting, we toured a home where all of the main floor bedrooms had screendoors. I understood that the family had allergies and were trying to confine the pets to just the public areas (where they had tile floors.) I had to admit a screendoor is a lot less bothersome than constantly putting up and then taking down a baby gate. Ever seen a cat climb a screen door? This is brilliant. I think I will do this in my home. I have one room that I need to keep my cats out of, but in the summer the door has to be open to circulate air. I know they will try to climb/tear the screen, but this is the best option I have come across. I would think this would be better for an office. I do think kids would destroy a door like this. 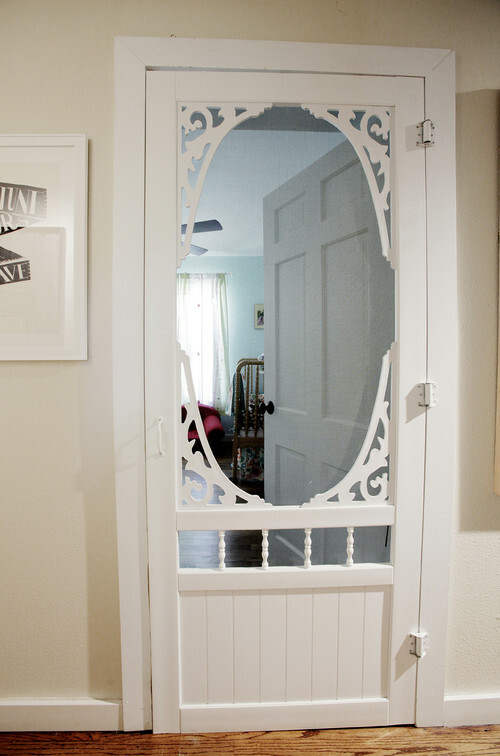 I want to do this for my craft room to keep the cats out, but the door frame is only 28 inches wide and the smallest screen door sold at Home Depot is 30 inches. Did you trim down the door?